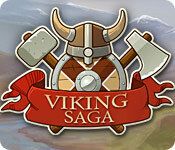 The exciting adventures of the young Ingolf await you in Viking Saga! When the great Viking King Arnar finds himself cursed by none other than Loki, he entrusts his youngest son, Ingolf with a quest to appease the mischievous God and break the curse. Sailing into the setting sun, Ingolf's drakkar crashes into an island where he must seek out Loki and return a cursed ring. Help Ingolf on his quest by clearing roadways and collecting resources in this adventurous Time Management game. Get ready to travel through Japan in the springtime. Play through four chapters of love and romance while solving colorful mosaic puzzles! Explore the ancient forest and help forest fairies discover hidden images.